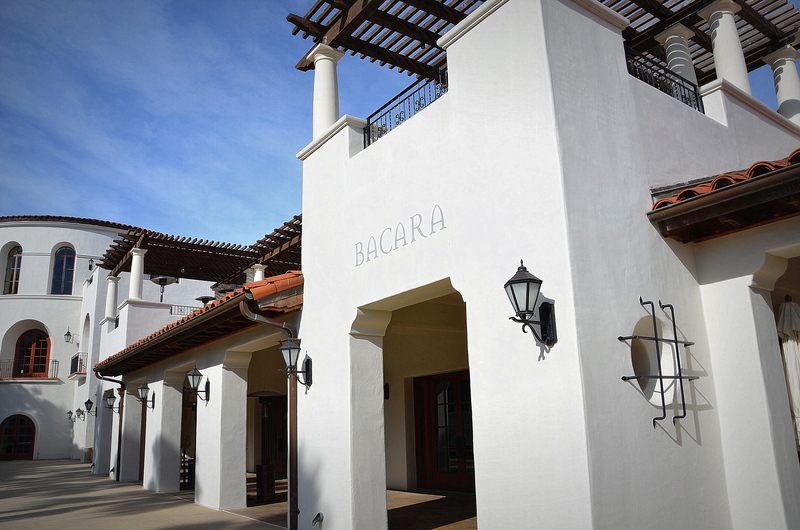 The Bacara Resort and Spa is located about 10 minutes north of Santa Barbara and boasts an incredible location on California’s central coast. The Bacara is designed with a Mediterranean warmth that meets old Hollywood glamour and, from its inception in 2000, it has been a retreat to a luxury and celebrity clientele….I won’t name names but let’s just say that I sat next to a couple of very recognizable stars in the lobby for several hours one evening. As someone who appreciates architectural details, I reveled in the subtle design elements and lush foliage throughout the resort. The crisp white paint, clay tiled roof and wrought iron detail creates a beautiful contemporary Spanish feel throughout the resort. Splashes of color are thrown in with decorative tiles and in vegetation plantings around the property. Palm trees scattered throughout the property give it that quintessential California touch. At the time I stayed at this resort, there were several buildings under tarps being renovated. I stayed in an original guest room that had a very partial ocean view. So my review is not based on a renovated room, and I will put it on my list to go back to see the newer rooms and provide an update. Based on what I experienced, the rooms felt spacious and the Mediterranean design was carried throughout the guest rooms. Something to keep in mind here, is that although the property is located right on the coastline, the two and three-story buildings are designed in a village setting with a majority of the rooms set around a courtyard. Most rooms will have a filtered view of the water or no water view at all. If you want a direct ocean view, you will have to be very specific in your request and book one of their prime rooms. This is not to say that any other view is disappointing as the grounds are very pleasant, however, I only say this in the event you assume you will get some sort of an ocean view. Be sure to take the time to catch one of the incredible sunsets. The full service spa is a huge draw for guests and locals alike. The Bacara Spa offers over 60 specialized treatments such as Wisdom of the Sea, OSEA Sea of Life and Sea Stone Therapy utilizing local organic herbs and salts and can be enjoyed on a rooftop terrace with a glass of bubbly. Many complimentary classes are offered to guests through the Fitness Center and Salon services are also available. You’ll find several different dining options from fine dining at the Miro Restaurant, to a relaxed fare at The Bistro all the way to casual fare at the Bacara Bar, Spa Cafe and Blend along with 24 hour in-room dining. Overall, I’ve stayed at many different resorts in the Santa Barbara area and this is without a doubt one of my favorites.